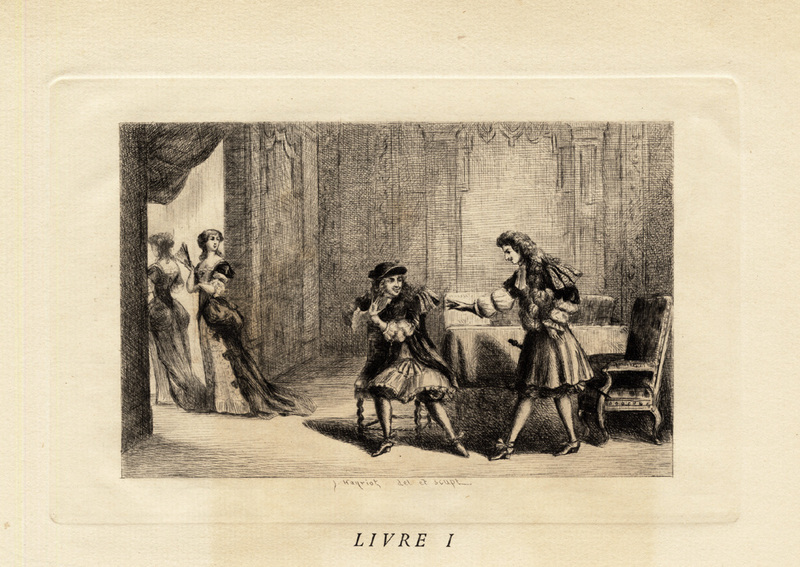 Subject: Plate: This plate shows a scene from a play by Moliere: Misanthrope. This plate shows Moliere, La Grange and Moliere's wife. Condition: Good. General age related toning. Irregular edges as issued with small tears. Paper partly browned by offsetting. Please study scan carefully. Medium: Original etchings on a vellin type paper. Size (in cm): The overall size is ca. 32 x 45 cm. The image size is ca. 19 x 12.5 cm. Size (in inch): The overall size is ca. 12.6 x 17.7 inch. The image size is ca. 7.5 x 4.9 inch. Description: This attractive original old antique print / plate originates from: 'Moliere Sa Femme Et Sa Fille. ', by Arsene Houssaye, published by Dentu, Paris 1880. (limited ed. 500 ex.) This work is a tribute to Moliere, his wife Armande Bejart and daughter Madeleine. Artists and Engravers: Arsene Houssaye (1815 - 1896), French novelist, poet and man of letters, was born at Bruyï¿½res (Aisne), near Laon. His real surname was Housset. This plate by J. Hanriot. Jean-Baptiste Poquelin, known by his stage name Moliere, (French 1622 -1673) was a French playwright and actor who is considered to be one of the greatest masters of comedy in Western literature. Among Moliere's best-known works are Le Misanthrope (The Misanthrope), L'Ecole des Femmes (The School for Wives), Tartuffe ou L'Imposteur, (Tartuffe or the Imposter), L'Avare (The Miser), Le Malade Imaginaire (The Imaginary Invalid), and Le Bourgeois Gentilhomme (The Bourgeois Gentleman).